"...Sincerity and a lot of spirit which was very moving, funny, convincing and always gripping." This is the simple story of an ordinary man, ‘Joe’ an ageing bartender in downtown, present day New York and the only dramatic character in the piece. The play charts his brief acquaintance with a new customer - ‘Mack’ - during his several visits to the bar where Joe works. He is a dreamer – a spinner and vivid illustrator of stories that metaphorically paint a picture of life in general, but more importantly, of his in particular. The two-fold thread of the piece is revealed in the title ‘To Be Frank’. The frankness of the character (being sometimes ‘off the wall’ in his theories on life), but also his life long association with Frank Sinatra. ‘To Be Frank’ would have been all he ever wanted out of a life which has been one of extremes – of highs and lows – all of which he easily and readily finds comparisons with in the life of his idol. This is not a biography of a star, but rather an insight into a star follower. A character whose life and aspirations were so strongly influenced by his idol that over the years the boundaries of reality, or what was and what could have been, became so blurred that on many occasions they became one. During the play, the sounds and sentiments of the era in which our character, as he says, “ … lived, loved and laughed…and lost ” are recreated by four superb singers with rhythm band accompaniment. They, through the songs of Sinatra, contextualise the audience to the musical genre of a period that is now accepted as the formative and subsequently golden age of popular music. It is an account of one man’s life, but it contains poignant issues that could easily belong to any one of us. If you would like to learn more about this piece or details of how to gain permission to perform it, please use the contact page or contact the publisher, Stagescripts. The photographs (opposite) are cast rehearsal shots from the 2016 production at Guide Bridge Theatre, Greater Manchester. The show to see this week. ...a must for all Sinatra Fans. ...a work of unusual insight and pace. 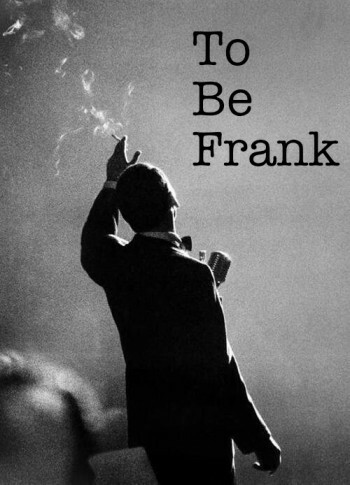 TO BE FRANK is the simple story of an ordinary man, ‘JOE’, an ageing bartender in downtown, present day New York and the only dramatic character in the piece. The play charts his brief acquaintance with a new customer - ‘MACK’ during his several visits to the bar where Joe works. The unseen “customer” is in fact the audience, who Joe proceeds to engage in a one-way conversation about anything and everything - but, especially, about his hero, FRANK SINATRA. If it sounds a bit like a “TALKING HEADS” scenario then so be it (and more about that later). The difference is that Joe’s soliloquy is delightfully interrupted by musical numbers that have been sung by ‘OLD BLUE EYES’ himself. The singing is done by four excellent vocalists, two male and two female, without the slightest pretension of giving them a “Sinatra Touch” - wise move. The songs are mainly well known but there is a sprinkling of lesser-known numbers giving the whole thing a nice edge. The singers were first class, and needed to be for some of the arrangements were tricky and the vocal range was extensive. All four were attractive personalities, good looking, very well turned out and blessed not only with super singing voices but with the ability to characterise a lyric and sustain an entertainment without a line of dialogue between them. They were, Anne Birchenough, Jill Taylor, David Glynn-Whitehead and John Wood and they were a delight. The only dialogue came from Bob Bright as Joe about thirty pages of it! It is good dialogue with good variations from FRANK, and a nice line of humour. Joe, like Frank, is no angel but he’s no devil either — and he is the ultimate fan, finding a sustaining facet of life in his admiration for his idol. The characterisation was excellent. His love, hate relationship with his father, his sadness at never really knowing his wife, his fulfilling relationship with his mistress, his relatively empty life (filled to some extent by his hero worship of Frank), were conveyed with deep sincerity and a lot of spirit which was very moving, funny, convincing and always gripping. The accompaniment for all the music was headed by Alan Dean and it was backing to die for. Singers would want to wrap him up and smuggle him into their brief cases for selfish solo use! He and the other two musicians were superb. The setting was attractive. Superior voile drapes with clever changes of lighting, a bar, a couple of tables, etc. It could be as simple or as classy as desired. The show was performed in aid of CHIC (Children’s Hearing Impaired Charities). It is now available in its original format or as a dialogue only (TALKING HEADS) solo acting performance. Geoffrey Holme, LAMDA, Greater Manchester Drama Federation. Last night, I had the pleasure of seeing one of Martin Paul Roche’s plays, To Be Frank, performed at the Guide Bridge Theatre in Audenshaw. At first glance, the performance stage looks bare, but within seconds of the play starting, you are transported into a run-of-the-mill bar in Downtown New York. The set consisted of a small bar, a couple of bar stools, two small tables, complete with ashtrays and had a distinct airiness that you’d expect from a smoky, beer stained, cellar-bar. The theatre is compact and perfect for this performance – it’s almost intimate, as if you are part of the production. As I sat in the front row, I felt as though the main character was talking right at (sic) me. The play starts with Joe (Mike Sammon), “a simple man and ordinary bartender. He is a dreamer, a spinner of tales, a painter of stories, who happily and eagerly tells his story to his customers at any opportunity – whether they want to hear it or not. And on this occasion, it is his newest customer, the unseen Mack”. Joe’s dream would be, “To Be Frank”, to be Old Blue Eyes. As he tells his story, four vocalists (Vicki Clarkson, Jill Taylor, Dave Brobbin and John Rawson) supported by a three-piece band (Claire Sweeney, Keyboard, Simon Rogers, Percussion and Rob Webster, Bass) perform a back catalogue of Sinatra hits. The quality of the music is excellent and the number of songs packed into the show is incredible. Sammon’s performance is funny, touching and entirely credible. He engages the audience with convincing sincerity and paints a portrait of his life in vivid colours – full of pain, happiness, wonderful memories and unrequited love. Writer and Director Martin Paul Roche has put together an amazing show with a clear focus, and Sammon, together with the vocalist and band create a rich environment that is impressive. Indeed, at the end of the show, I wanted Joe to be my mate. I want him to be the barman at my local. I encourage you to go see this production. Come out and support these local actors in a local theatre.